BridgeEnglish, Denver, specializes in teaching English as a second language to students from across the world. Of the many programs we offer, one of our largest is Academic English. Here, students take academic writing, grammar, speaking/listening, and reading classes that are intended to prepare them for the rigors of university work. 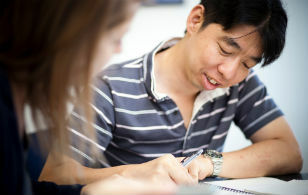 Although extremely important, a student’s IELTS/TOEFL score and their grades are not the only measurements on which they will be evaluated upon. Many times, and especially for graduate students, they will have to prepare a professional resume and a statement of purpose. Moreover, it is wise for students to be prepared with two or three letters of recommendation from past professors or employers. This is where the Bridge English academic advisors come in! They are willing and ready to help Bridge students in preparing for the realities of the application process and in managing expectations once in school. Resume development: A resume or CV is a vital part of any student or professional’s portfolio. This 1-2 page document highlights the main accomplishments in a person’s academic and professional career. TIP: Edit, edit, edit!!!! In a stack of 100 applications, having one or two spelling or grammar errors may eliminate your resume immediately. Writing a statement of purpose/personal statement: In addition to an applicant’s test scores and grades, the best way for a university to gauge the interest and the personality of an applicant is through a written essay. Many times this essay asks the applicant to address why he/she wants to attend the university or program, and it is a great opportunity to show the review committee why you are unique and deserve to be admitted to their school. TIP: Find a way to inject personality into the essay. Admissions officers read hundreds, if not thousands, of applications every year. Making your essay unique and memorable will allow you to stand out from the crowd. Be careful though, you want to show off your personality, but not at the expense of your professionalism. Time management skills: One of the biggest struggles for both American and international university students is time management. This is due, in large part, to the drastic change in schedules from high school to university. In high school, a student’s day is highly structured and planned, leaving little time for serious distractions and missteps. Upon entering university, and almost over-night, university students are expected to manage their time and progress. Oftentimes, a student taking 15 class credits may have minimal class time but they forget that for each hour spent in class, they may have up to three hours of homework or studying. TIP: Set short-term and long-term goals to help manage your time. It’s easy to become overwhelmed by the amount of work you have in university. By taking each assignment and paper as it comes you will find the workload more manageable and your successes will be more satisfying and more enjoyable. Overall, the academic advisors at bridge are aware of the importance and necessity of out-of-classroom skills and have begun developing intensive workshops and materials to assist in this process. The aforementioned workshop materials are just a few of the many available to Bridge students on a quarterly basis, and are continually being monitored by advisors so they are relevant and up-to-date. While the main goal of Bridge is to matriculate well-rounded, capable, and responsible students, we know from experience that this process does not happen over-night. Therefore, these series of university workshops have been implemented in order to further assist our students in the arduous task of finding, applying, and being accepted into university. esl-blog international students, tools for success, university workshop. permalink.